A record estimated field of 700 entries will compete for the largest purse in handicapping tournament history – projected at more than $2.96 million in cash and awards – and horse racing’s official title of “Horseplayer of the Year” – at this weekend’s 19th NTRA National Horseplayers Championship (NHC) Presented by Racetrack Television Network, STATS Race Lens™ and Treasure Island Las Vegas. The three-day tournament, Friday to Sunday at Treasure Island, will offer a first-place prize of $800,000. Noel Michaels, author of Handicapping Contest Handbook: A Horseplayer’s Guide to Handicapping Tournaments, will host live video coverage daily, Friday to Sunday, from 5-8 p.m. ET (2-5 p.m. PT) on the NTRA Facebook page (www.facebook.com/1NTRA). Programming will include interviews with NHC personalities, handicapping and previews of mandatory races, and live coverage of Sunday’s Final Table. Additional news and exclusive content will be shared on Twitter via the official NTRA account, @NTRA. At the Races with Steve Byk will broadcast live on SiriusXM satellite radio (Sirius 219; XM 206; Online 964) from Treasure Island during the show’s regular hours, 9 a.m.-Noon ET (6-9 a.m. PT), on Friday morning, and online at www.stevebyk.com daily, Friday to Sunday, Noon-5:30 p.m. ET (9 a.m.-2:30 p.m. PT). Next Monday’s regular 9 a.m.-Noon ET (6-9 a.m. PT) show will feature an extended NHC recap. Defending NHC champion Ray Arsenault – who last month was honored with an Eclipse Award as “Horseplayer of the Year”– heads this year’s record field, which is comprised of 570 individual players (130 are dual qualifiers playing the maximum two entries). As the 2017 NHC winner, Arsenault, of Thornhill, Ontario, Canada, near Toronto, received an automatic berth into this year’s tournament to defend the title he won last January when he bested 653 other entries. Arsenault won by amassing a mythical bankroll of $407.70 from a total of 53 Win-and-Place wagers pared from a mind-melting menu of more than 150 races run at eight different tracks. Arsenault will seek to become the first-ever two-time winner of the NHC, as will 11 other past winners that have qualified. The other qualifying champions: Paul Matties (2016), John O’Neil (2015), Jose Arias (2014), Michael Beychok (2012), John Doyle (2011), Brian Troop (2010), John Conte (2009), Richard Goodall (2008), Stanley Bavlish (2007), Steve Wolfson Jr. (2003), and Judy Wagner (2001). The winner of the Breeders’ Cup Betting Challenge (BCBC) is eligible for a $3 million BCBC/NHC Bonus. San Francisco resident Nisan Gabbay, a 40-year-old software developer and owner of a tech startup, earned $350,000 for winning the BCBC at Del Mar in November with a final live bankroll of $176,000. First prize at the NHC is $800,000, meaning that successful completion of the BCBC-NHC double would be worth $4.326 million. As the winner of the 2017 NHC Tour, Mike Ferrozzo won $100,000 and an NHC berth. Should he go on to win this year’s NHC, he will receive a $2 million bonus in addition to the NHC grand prize of $800,000. Hawthorne sponsors million-dollar bonuses for their Holiday Extravaganza champions. John Ukleja won the Dec. 29 contest and Paul Langley won on Dec. 30. Both are eligible for a $1 million bonus should they go on to win the NHC. Ed Peters is eligible for a $500,000 bonus should he win the NHC as the top qualifier out of The BIG One at Laurel Park in September. 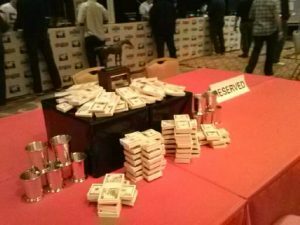 In its 19th year, the NTRA National Horseplayers Championship (NHC), previously known as the National Handicapping Championship before a revamping of the brand in 2017, is the most important tournament of the year for horseplayers and is the culmination of a year-long series of NTRA-sanctioned local tournaments. NHC players qualified via contests hosted by 40 racetracks, casino race books, handicapping contest websites, Advance Deposit Wagering (ADW) outlets, simulcast distribution networks, horse owner associations and other Thoroughbred racing organizations. The NHC 19 qualifier hosts were Aqueduct, Arlington Park, Belmont Park, BetPTC.com, Breeders’ Cup, Canterbury Park, Century Bets, Churchill Downs, Del Mar Thoroughbred Club, Ellis Park, Equestricon, Gulfstream Park, Hawthorne Race Course, Hollywood Casino at Penn, HorsePlayers.com, HorseTourneys.com, Indiana Grand, Keeneland, Laurel Park, Lone Star Park, Los Alamitos Race Course, Louisiana Downs, Meadowlands, Mohegan Sun, Monmouth Park, National Horsemen’s Benevolent & Protective Association, National Thoroughbred Racing Association, New Zealand Metropolitan Trotting Club, Public Handicapper, Santa Anita Park, Saratoga Bets, Saratoga Race Course, Surfside Race Place, Tampa Bay Downs, The BIG One, Thoroughbred Owners of California, Treasure Island, TVG, Woodbine Entertainment Group, and Wynn Las Vegas. The tournament format for the NHC is meant to be the best possible test of overall handicapping ability. Players attempt to earn the highest possible bankroll based on mythical $2 Win-and-Place wagers. Assigned “mandatory” races – eight per day on Day 1 and Day 2 and seven at the Final Table – are selected by NTRA Director of Media & Industry Relations Jim Mulvihill, Treasure Island Director of Race and Sports Tony Nevill, Monmouth Park Marketing Manager and Contest Director Brian Skirka, and Equibase National Racing Analyst Ellis Starr. Mandatory races will be announced at least 36 hours prior to each contest day (Wednesday evening for Friday, Thursday evening for Saturday, Friday evening for Sunday) on Twitter (@NTRA) and NTRA.com. 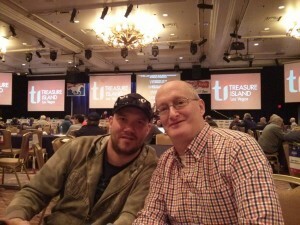 Treasure Island will play host to the NHC in its second-floor ballroom for the seventh straight year. On Saturday, the NTRA also will host an invitation-only online tournament, the Tito’s $10,000 Charity Challenge. A field of about 40 celebrities and racing personalities will compete to have $10,000 donated in their names to three different causes – the Thoroughbred Aftercare Alliance, official charity of the NHC ($5,000); a nonprofit of the winner’s choosing ($2,500); and a nonprofit to be determined by Tito’s ($2,500). In its 19th year, the NHC is the most important tournament of the year for horseplayers and is the culmination of a year-long series of NTRA-sanctioned local tournaments conducted by racetracks, casino race books, off-track betting facilities and horse racing and handicapping websites, each of which sends its top qualifiers to the national finals. There are no bye-ins to the NHC. Each year, the NHC winner joins other human and equine champions as an honoree at the Eclipse Awards. For more information on the NHC, visit NTRA.com/nhc.